The Visiting Nurse Service of New York’s Nurse-Family Partnership program pairs nurses with first-time mothers-to-be to support healthy parenting. Lincoln Medical Center provides a variety of pediatric and perinatal healthcare services to families in the South Bronx. 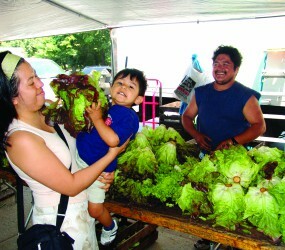 Hospital-based farmers markets offer affordable fresh produce and nutrition education to communities throughout NYC. Volunteers at God’s Love We Deliver chop and prepare delicious and nutritious meals for New Yorkers in need.